Governor Chet Culver says he’s confident Lake Delhi will be restored, but some property owners around the lake in Delaware County aren’t sure they’ll be there by the time it’s a lake again. 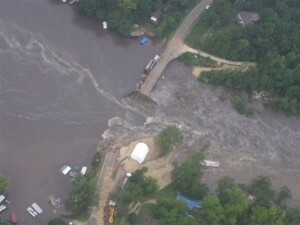 The dam on the lake burst last Saturday, damaging or destroying hundreds of homes and boats and other property. The area is privately-owned, meaning government assistance to Lake Delhi residents could be limited. Lake Delhi trustee Jim “Buzz” Graham collects the tax money supporting the lake and dam. He says residents need all the help they can get from volunteers, the state or federal government. “We’re looking for anything from anybody that we can get,” Graham said. Graham adds the damage affects more than the lakeside owners. “You’re going to lose the largest recreation area in northeast Iowa if this isn’t here,” Graham said. Governor Culver says he has the authority to “tap” a broad range of state programs and cash reserves to find money for flood victims. In addition, Culver is asking President Obama to declare Delaware County and other counties in the area as disaster areas – which would clear the way for federal financial assistance.